Bank Mutual provides banking and financial services such as personal and commercial banking. 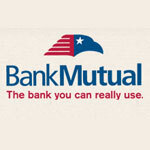 Bank Mutual was founded in 1892 and is a subsidiary of Bank Mutual Corporation. The bank is based in Milwaukee, Wisconsin. The Bank Mutual provides services such as banking, lending, money management, mortgage, interest rates, etc. The Bank Mutual operates nearly 76 branches in and around Wisconsin and Minnesota and has about 22,000 ATM which provides surcharge free networks. The customers of Bank Mutual can manage their accounts online by online banking, online bill pay, eStatesments, paperless banking, payments, etc. Telephone banking is also available in Bank Mutual. There are currently 0 consumer reviews about Bank Mutual available. Share your review. Please take a note that you are about to post a public review about Bank Mutual corporate office on CorporateOffice.com. This review will be public, so please do not post any of your personal information on this website. If you would like to contact the corporate offices of Bank Mutual, please use their contact information such as their phone number, website, and address listed above to contact them. However, sometimes staff from Bank Mutual headquarters do read the reviews on this website.